This little witch will most likely be my last Halloween project this year! Created last night while listening to Hurricane Sandy's wind howl and rain pummel our house. She was quite the storm. Thus, I've christened my little witch - Sandy! Just a very soggy paddock. Creative Inspirations Paint - Blue Ice. It's a bit hard to see in the photo, but added such a nice shimmer to her dress and the lacy border (and a wee bit in the web on the tag)! I can see myself going broke once again in the near future getting lots of awesome glimmery colors! The little witch and "boo" is from the Phyllis Harris Unity Stamp kit, "A Tiny Witch" (such a darling girl) and the ribbon is a the 3GirlJam Crinkle ribbon, "Spooky Bundle". Everything else, from the punches to the cardstock is Stampin Up! I used watercolor card stock and my Schmincke watercolors (LOVE these more than any other watercolors I've used!) and after it dried a minute or two, I painted her dress in strategic places with the Blue Ice paint. The effect I was looking for was the shimmer that would naturally occur when walking in sparkles! I think it worked. Then I wanted to carry the shimmer forward...that's why I painted the lacey border (also watercolor card stock) with the same paint. I believe all the added shimmer brought out the shimmer in the crinkle ribbon. What do you think? Halloween challenge over on "Designed to Color"
Straight to you from me..Drying out on the east coast! Oh Rebecca, such a lovely post and quite fitting for such a lovely little witch. Darling job adding the sparkle to this one. Glad you are having fun with the paints. I still need to get mine out and play! Awesome Halloween card! That image is adorable!! Thanks for joining us at Crafty Calender this month! Love her green glow, or did she eat too much candy? I got your lovely package of creations. NW I feel like I owe you a thank you card as your creations were so stunning. I will treasure them! I was so glad to see your post this morning. I was worried about you when you hadn't linked up yet last evening! cute card. i've been surfing. my dear sweet brave,wonderful almost perfect husband died two weeks ago from a rare, agresive cancer after 8 mths of horrible treatment. so i'm trying to distract myself and find other things to think about so i'm not crying 24/7. i've followed your blog for a long time since we both have cream poms. thanks so much for being there. just went thru my first hurricane alone but it wasn't as bad here as i was anticipating. Purple & green is my favorite color combo, and the details you added here look fantastic! I LOVE the little tag!! 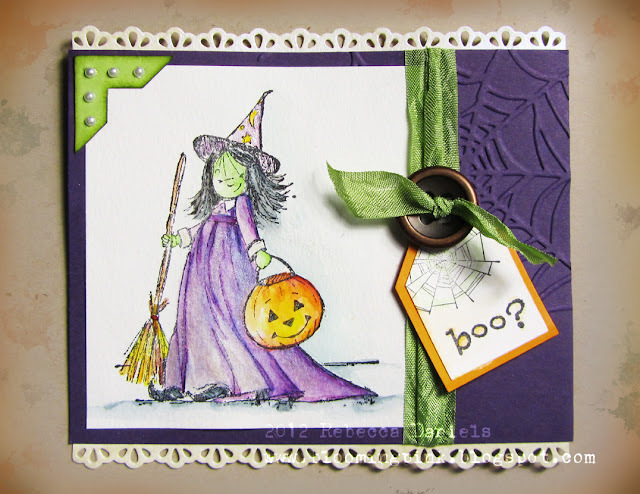 What a cute witch-I love your watercoloring! Good luck cleaning up from Sandy! LOVE this! She is perfect in green and purple. The embossed card base works so well, too, as does the little tag on the ribbon. Sweet! Your card looks so cute.Thank you for joining us at Cards und More. That's just lovely. Like the embossed background, the colour combination and all the details. Great card! Thank you for joining us at CI Paints! What a stunning card. So lovely design. I like the colors and that image is so cute. Also love the CAS style design like Plastic cards which make the card POP. Thanks for sharing.